Derk always has ideas, a lot of them, perhaps to much of them. The idea of these ”dreams” pages is to publish some of Derk’s ideas and concepts so that other designers can pick it up and use the concepts. For Derk himself it is impossible to work out and finish these concepts to actual products. It is a large step from a concept to a good working product. The development of an idea or concept to a well working product can take an enormous amount of time, energy and money. For a natural person these 3 ingredients are limited. Anyone is invited to use and work out Derk’s ideas, especially students are invited to do so. Although Derk claims copyright on all of his concepts and work, all copying and use for private and research and development use is free of charge. If any further development leads to commercial use a mutually reasonable fee is appreciated. Some 25 to 30 years ago Derk made a choice to concentrate on his concept rowingbike. He thought he could finish the rowingbike within a year or so but that turned out to be much longer. It was and is a continuous developing process that got more quiet only after 20 years, when the revolver shifting system for the Snek transmission was introduced. Derk’s choice for developing the rowingbike turned out to be a good one, the sport of rowingbike is fabulous (at least for Derk) and still not boring after 30 years of intensively riding rowingbikes with an average over 10.000 km per year. Besides success in the sense of fun, health and happiness the rowingbike was providing income for Derk and his family. That is only after the first 15 years of being an expensive hobby :-). 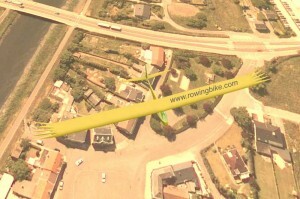 The rowingbike has not yet been a big commercial success although it certainly has the potential to become a big boomer. As Derk is more a designer, perhaps inventor, than a businessman it is not his ambition to start a large scale production. It would be good if a enthusiastic sport-& business-man would pick it up and take the rowingbike production to a larger scale. Than Derk could concentrate on new designs. “As long as that is not happening I am glad to continue my small niche rowingbike production myself. It is fun for me and more important for my clients whom I do not want to withhold the fun of riding a rowingbike. Unfortunately this withholds me the time to develop other products but I do not really mind as I think the rowingbike is the best choice within all of my ideas and with the ” dreams” pages on this website I hope to succeed to find other people to work with my other ideas. This has worked very well before with my ideas on flight with a human powered ornithopter. During several years of intensive contact with Todd Reichert from Toronto University I was able to contribute in the development of the ornithopter from Toronto University. As a partner and sponsor ( see click here)I could contribute and I was moved up to tears when I saw their beautiful machine fly.